"Most of the albums we've talked about have been all about world creation, haven't they? An internal logic which makes all the tracks relate to each other." It's a chilly early April afternoon, and Night Slugs co-founder Alex Sushon, aka Bok Bok, is sitting in the garden of Camberwell's South London Gallery discussing thirteen of his favourite records. "There's a thread running through all of these, where there's no disparateness about the album, it's all one self contained project. There's got to be a really good reason why twelve tracks that interrelate are on the same record. It's massively important for Slugs as well. We're always thinking about how these things fit together, what shape they should take." That awareness has been a defining characteristic of Night Slugs since its founding. Having grown up in London, Sushon caught the grime bug early last decade as the genre emerged from the fragmenting garage scene, swiftly becoming a devotee and a regular at scene-incubating night FWD>>. 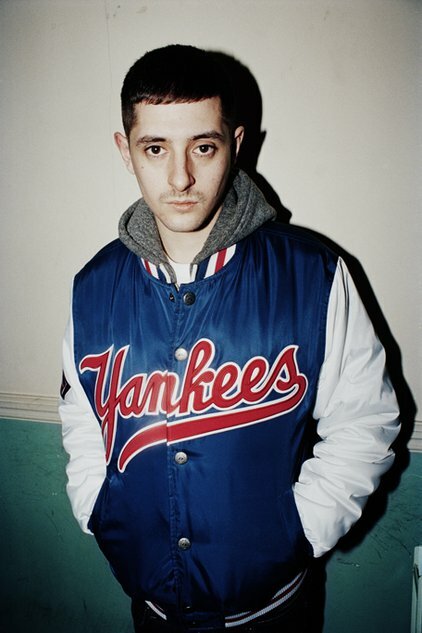 However, when the evolution of the grime scene drew the genre away from the dancefloor 12" format, he began delving into club styles from around the globe that packed a similarly visceral punch, including Baltimore club, Chicago and Detroit house, juke and ghettotech, and South African house. Night Slugs was the eventual result: founded as a London club night in 2008 with friend and collaborator James Connolly (aka L-Vis 1990), it created a space for the duo to unite those varied musical interests in a dancefloor setting, as well as to book kindred DJs - including the likes of Hyperdub boss Kode9, Oneman, Lil Silva and Kingdom - with similarly broadening horizons. The duo launched Night Slugs as a label in early 2010, kicking off in firey form with Mosca's Square One EP and its crowning centrepiece, the tripartite, neon-flecked odyssey 'Nike'. United both by Sushon's distinctive artwork and a shared love of grime, R&B and high-impact mutant club music of many strains, the collective of friends at the label's core - Bok Bok and L-Vis, with others including Jam City, Girl Unit, Kingdom and Egyptrixx - have since formed one of the most aesthetically and musically coherent focal points within a rapidly evolving bass music community, both in the UK and further afield. The last eighteen months, however, have seen Night Slugs really come into their own. In an increasingly genre-dispersed dance world where 'globalised' bass music too often means the ahistorical, self-referential and exploitative excesses of mainstream EDM, they're a great example of how to assimilate worldwide club music influences without pillaging from them, instead actively engaging with and drawing attention to the (often marginalised) communities they're inspired by. Similarly, their US sister label Fade To Mind, established by Kingdom in 2011, has blossomed into its own highly productive creative community, and forged links with innovative US scenes like ballroom and Jersey club. ("I just think it shows how you can come at the same series of influences from different directions, different contexts," reflects Sushon of the kindred approach shared by the two sister outposts). And following the 2012 release of Jam City's ambitious and frequently dazzling Classical Curvesalbum, last year's Club Constructions series of 12"s found the Sluggers alighting upon a glassy, hi-tech shared sound, where once-recognisable genre signifiers are surgically isolated, remoulded and reframed within thrillingly precarious, razor-edged rhythmic architectures. It's an aesthetic that's already proving highly influential on upcoming crews of younger producers whose formative club music experiences were spent dancing to crews like Night Slugs and Hyperdub. The taut tripwire funk of Bok Bok's own new EP, Your Charizmatic Self - his first fully solo release in three years, released later this month - enacts similarly violent transformations upon sonic tics you'd more readily associate with late 80s to early 90s R&B production. Clearly inspired by grime's block-like compositional sensibility, its tracks are simultaneously stark, lushly melodic and brutally choppy. Sinuous, flickering guitar licks ring out into zones of profound silence, snapping off abruptly to leave brief vapour trails snagging at the senses; buckets of glitter cascade down atop snaking square-wave bass; snares crack like gunshots, hinting at mounting tension beneath the music's chrome-cool surface. Lead track 'Melba's Call' is a dramatic duel with vocalist Kelela, whose Cut 4 Me mixtape last year formed the first direct feedback link from the Night Slugs/Fade To Mind camp back to the vocal R&B that's inspired much of their own music. "I think it was on the cards anyway, because we all like music for the radio, we love R&B, we love songs as well as rhythm tracks," says Sushon of the crew's increased interest in creating vocal music. "So it just makes so much sense to try and take it that way. And I think everyone was really ready to hear that anyway - especially with people like Girl Unit and Kingdom, people are always asking, 'When are you going to be working with such-and-such? ', almost in a sardonic, frustrated kind of way. But now it's a genuine question. 'When are you going to be working with such-and-such?' Because it's actually feasible, and those worlds are so close now. I feel like the mainstream is more open to different kinds of sounds than ever, and it's almost impossible to differentiate now. The world of radio music and R&B and these kind of things has been seeping into what we've been doing for so long that's it's nice to be able to actually send that the other way a little bit. Now is the moment we can finally start to give back to the world that's actually been feeding us for so long. It's an exciting time."